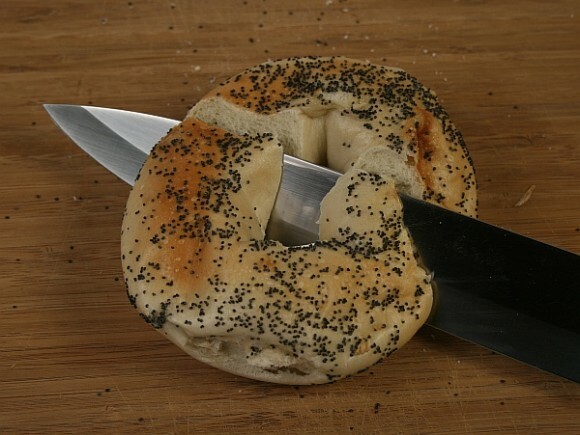 Since this is my one hundredth Math Monday column, I decided to celebrate with a return to yet another mathematical way to slice bagels. (For others, see: 1, 2, 3.) 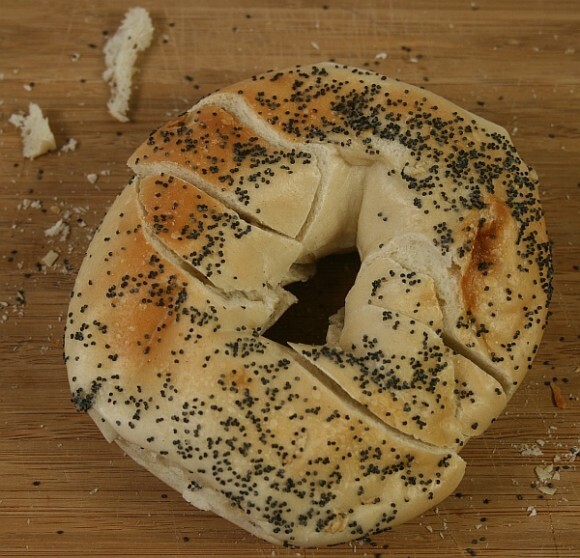 How can you slice a bagel into thirteen pieces with just three simultaneous planar cuts? This is a classic problem of recreational mathematics, made famous by Martin Gardner. Some of the pieces will have to be rather small, but the cuts are doable. 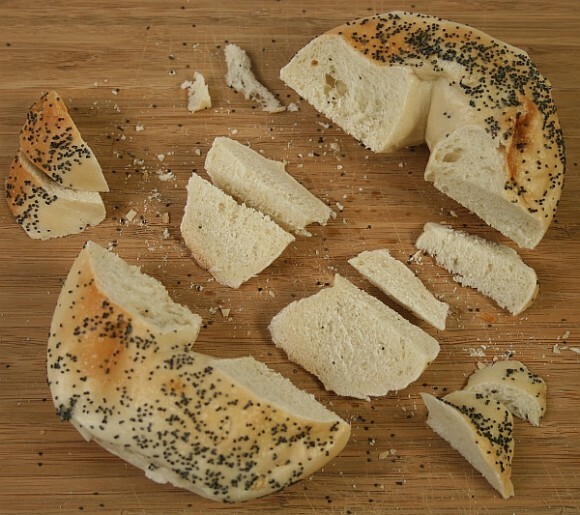 Start with a slanted cut as steep as you can make it without keeping a hole in either the top or bottom piece. Then make a similar cut slanting the other way. This will give you six pieces: two large C-shaped parts and four smaller wedges. If you put it back together, but temporarily leave out the top two wedges, it looks like the image below. The final cut will be roughly vertical, going through the indicated red line. 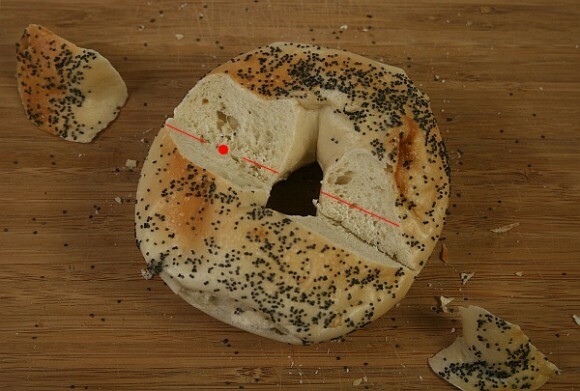 You must aim for the middle of one of the sides, marked with a red dot in the image below. The cut is rotated slightly to be off-center on the other side. Two thin pyramid-shaped pieces, whose tips meet at the red dot, will be shaved off the C-shape pieces. This cut also severs all four wedges and cuts a small piece off one of the C’s on the side away from the red dot. In total, there are thirteen pieces. 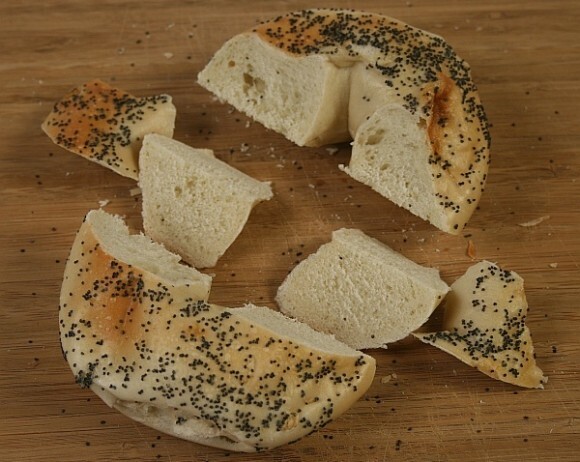 This works best with a slightly stale bagel, so now you know what to make with them! This article first appeared on Make: Online, January 9, 2012.